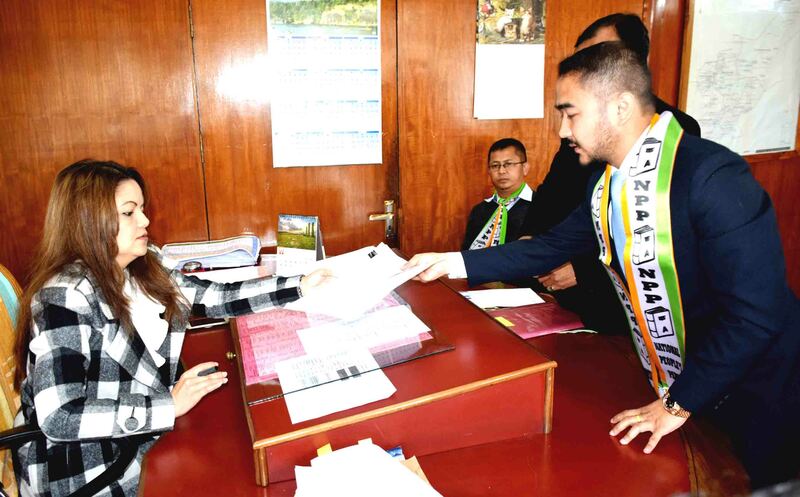 SHILLONG/NONGPOH/NONGSTOIN/JOWAI/MAWKYRWAT: Several candidates filed their nomination papers on Tuesday. A total of 35 candidates filed their nominations for the Khasi Hills Autonomous District Council (KHADC) and 11 candidates for Jaintia Hills Autonomous District Council (JHADC). Out of the eleven candidates who filed the nominations, four are sitting MDCs. They are sitting MDC from Nartiang, Thombor Shiwat, Shilliangmyntang MDC Rudaio Tang, Riioo Sten of Barato – Mukroh all from NPP and Wahiajer MDC, Hermon Phawa of INC. The seven new entrants who filed their papers are Baitlang Pohsngap from Jowai South (INC), Eveningstar Teron from Nongjngi Constituency (NPP), Aiborlang Shadap from Barato Mukroh (INC), Wistful Disting Syiemlieh from Jowai Central (IND), former social activist, Brightstar Chyrmang from Jowai North (NPP), Dawan Lyngdoh from Myngsngat (UDP) and Viceroyalson Nongtdu from Sutnga Narwan(INC). Morning Mawsor filed his nomination papers before the returning officer of Mawshynrut PD Sangma. Mawsor said though he is alone among the candidates from PDF, he is confident that people will vote for him and trust him as a representative in KHADC.
) He also said that during his term as an MDC, he had worked hard for the people of the constituency in terms of development. He assured to fulfill the aspirations of the people of his constituency. In Mawthadraishan UDP candidate Jambor War also filed his nomination papers. In Nongpoh, as many as twelve candidates from different political parties and constituencies of Ri Bhoi district filed their nomination papers. The candidates who filed their nominations include Rona Khymdeit from United Democratic Party (UDP) and Balajied Ranee from Indian National Congress (INC), who will be contesting from Nongpoh Constituency. From Mawhati Constituency, the candidates include Charles Marngar (INC), Mayborn Rapthap (Independent), Kisborly Kharbani (UDP) and Rinik Mukhim from NPP. From Jirang Constituency, William Mynsong (INC) and Victor Rani (NPP) filed their papers while from Umsning Constituency, Rocky Augustine Marwein (INC) and Donkupar Sumer (UDP) filed their nominations. Meghalaya Pradesh Congress Committee President, Celestine Lyngdoh was also present accompanying INC candidates along with Umroi and Nongpoh legislator, George B Lyngdoh and Mayralborn Syiem respectively. Sitting MDC from Nongpoh, Rona, the lone woman candidate was accompanied by Rayonald Kharkamni and the district leaders of the party. The NPP candidates were accompanied by the Mawhati legislator, Dasakhiatbha Lamare. In South West Khasi Hills, National People’s Party (NPP) candidate from Mawkyrwat , Diverland Lyngdoh filed his nomination papers. He had earlier contested the council election on Congress ticket but was unsuccessful. In 2014, he came second after he was defeated by Hadrian Lyngdoh of the UDP. Lyngdoh will be contesting the election against HSPDP candidate Nolip Lyngdoh, Congress candidate Carness Sohshang, UDP candidate Anvil Lyngdoh and PDF candidate Hadrian Lyngdoh.